The wonderful Rick Stein is one of André’s favourite chefs. One night before dinner André was watching good old Rick’s show and he did a cracking Shanghai style pork belly. 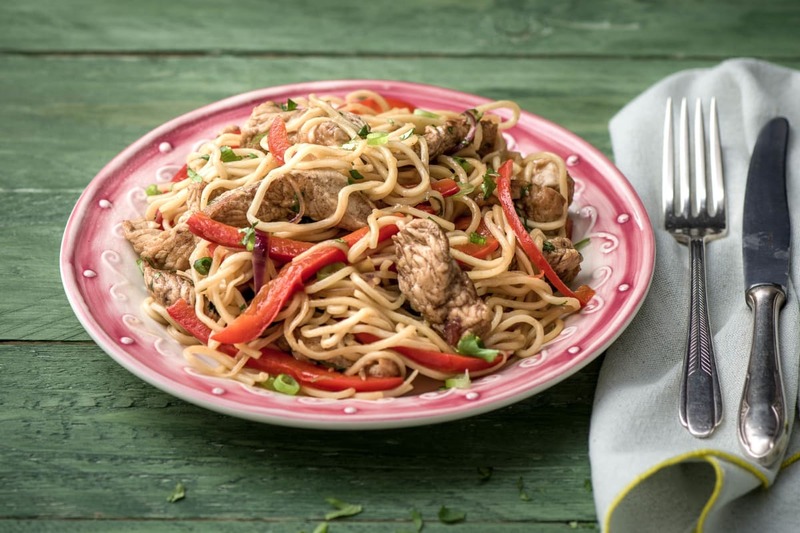 Feeling inspired and somewhat ravenous, our André felt slightly sombre about the lack of pork he had in the house - and so his Shanghai style turkey stir-fry with noodles was born. Put a pot of water on high heat and bring to the boil. Cut the turkey steaks into 1cm wide strips. Sprinkle over the Chinese 5 Spice, mix well and leave to marinate. 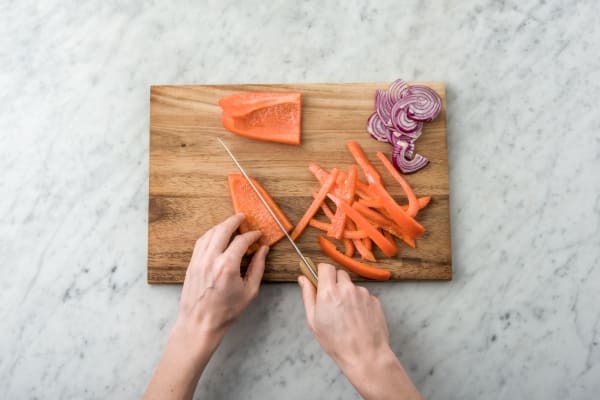 Wash your hands, knife and chopping board and then get on with the rest of your prep. Remove the core from the red pepper and thinly slice. Cut the red onion in half through the root, peel and then slice thinly into half moon shapes. Chop off the spring onion roots and slice them as thinly as you can. 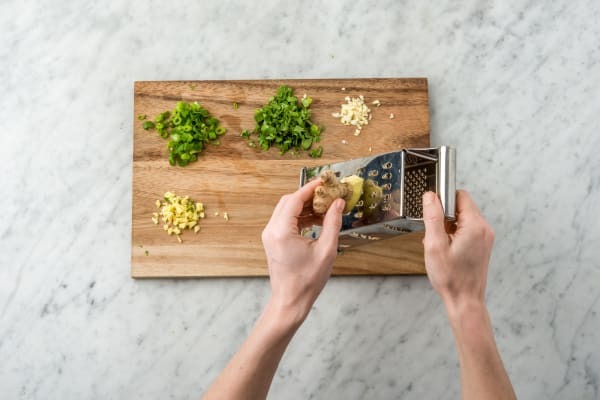 Peel and grate the ginger and garlic. Roughly chop the coriander leaves. Pop the noodles into the boiling water and cook for 4 mins. Drain in a colander and then run under cold water until the noodles are cold. Tip: This is to stop them cooking anymore. 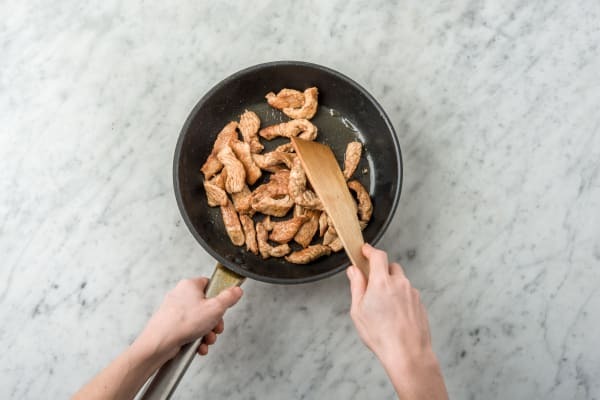 While the noodles are cooking, heat a large frying pan or wok on high heat and add 1 tbsp of oil.Cook the turkey strips for 4 mins making sure they get nicely browned. Tip: Cook the turkey in batches to make sure the meat does not stew. Transfer the turkey to a bowl and keep until later. Wipe the pan with a piece of kitchen paper and then add another 1 tbsp of oil. When the oilis very hot, add the peppers and cook for 3 mins before adding the red onion. Cook for another 2 mins and then pop the turkey back into the pan. Add the ginger and garlic and cook for another minute before stirring in the drained noodles, soy sauce and rice vinegar. Toss well, to make sure all the ingredients are combined and cook for another minute to make sure your noodles are piping hot. Finish your stir-fry by adding the chopped spring onion and as much coriander as you like. Serve immediately and enjoy!